Background: an IO:O image showing the 2013 outburst of M31N 2008-12a taken on 28th Nov 2013. The white circle shows the position of the nova. The white boxes indicate the position of one of the coincident HST fields. Inset: an HST image of the region surrounding M31N 2008-12a. The green ellipses indicate the search region for the progenitor, and the red cross indicates the position of the progenitor candidate. In late 2013 another outburst of a rather unusual "recurrent nova (RN)" in the Andromeda galaxy, M31, was announced by the intermediate Palomar Transient Factory (iPTF). Novae are thought to be associated with binary systems which undergo a sudden brightening as material from an evolved secondary star falls (or "accretes") onto a compact primary star, usually a white dwarf. The accreting material ignites via nuclear fusion producing a sudden burst of radiation. Recurrent novae are - as the name suggests - objects which undergo multiple outbursts. Like other RN, the object in M31, dubbed M31N 2008-12a, has been observed in outburst a number of times in the past. What makes this particular object interesting is its very short "recurrence timescale", i.e. the time between outbursts. M31N 2008-12a outbursts have been recorded almost annually since late 2008, when the object was first identified as a nova. Previously the most frequent RN was the Galactic system U Scorpii, which has a ~10 year inter-outburst time, making M31N 2008-12a all the more remarkable! IO:O mounted on the bottom of the Liverpool telescope. 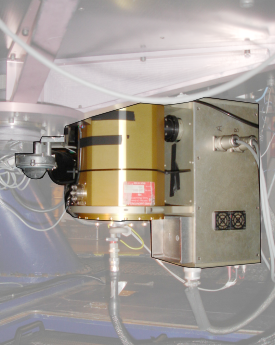 The gold cylinder is the dewar that houses the CCD detector, cooled to -110 degrees C; the grey box on the right contains the instrument electronics. M31N 2008-12a is classed as a "very-fast" nova because it takes just four days for the brightness of the object to decline by two magnitudes. As such, our knowledge of its "lightcurve" (a graph showing how the object's brightness changes with time) is limited, even after five outbursts have been witnessed. Follow-up observations of the RN - something the LT does extremely well - were clearly needed. Following the 2013 outburst, Dr Matt Darnley of the Astrophysics Research Institute here at Liverpool John Moores University formed a collaboration with Dr Martin Henze of the European Space Astronomy Centre in Spain. Their goal was to investigate ground-based optical plus space-based Swift X-ray and UV observations of the outburst, as well as Hubble Space Telescope (HST) infra-red, optical and UV observations of the "progenitor" system, i.e. the system before an outburst occurred. The collaboration also included LJMU's Steven Williams and Prof. Mike Bode. 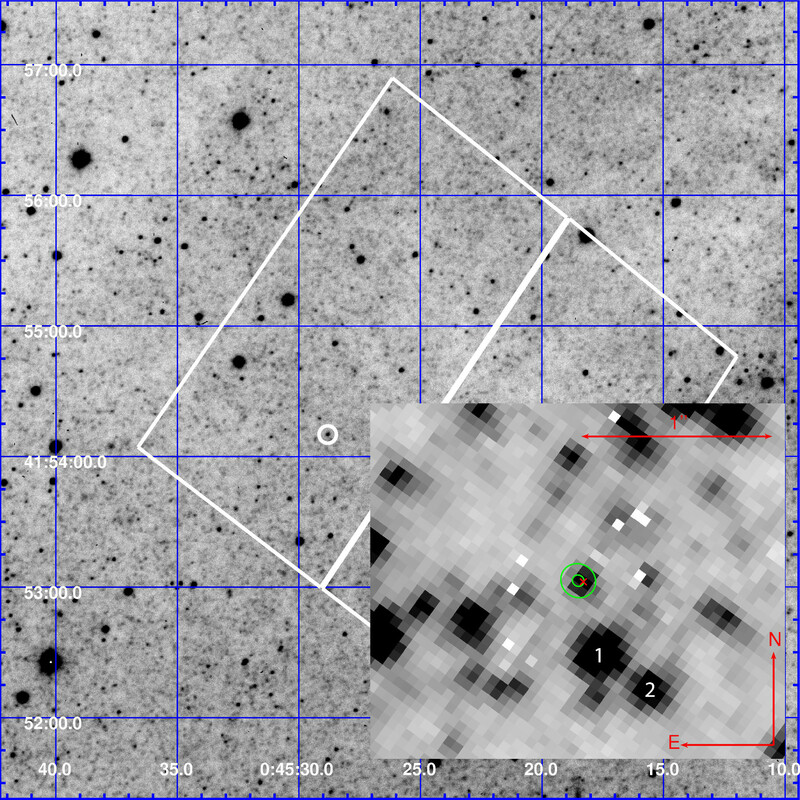 A Liverpool Telescope IO:O image of the 2013 outburst, shown on the right, was used to precisely determine the position of the nova so that a search for a progenitor could be made. Archival HST observations - taken when the system was not in outburst - indicated the presence of a system coincident with the outburst position. This progenitor is consistent with a binary system known to contain an evolved secondary star (a sub-giant or red giant) and a luminous accretion disk. Such a bright disk indicates a high accretion rate, which is required for a system with such a short recurrence timescale. An X-ray plus UV monitoring campaign undertaken with the Swift satellite soon after the 2013 outburst clearly detected a bright X-ray source only six days after the optical discovery. Such X-ray emission can only be detected when the nuclear burning on the surface of the white dwarf is viewed directly. The X-ray source persisted for two weeks before "turning-off", indicating the end of the nuclear burning phase. From these and other supporting observations Darnley et al. were able to identify the primary as a very high mass white dwarf. Such a system - containing an evolved secondary star, a high mass white dwarf star, and a luminous accretion disk - coupled with a short recurrence time, is a prime candidate for a system that may one day become a "Type Ia supernova". SN Ia can be used to accurately measure the distances to very distant galaxies, and thereby map the expansion (and indeed the acceleration!) of the universe. As such our understanding of Type Ia supernova is of considerable importance. With its one-year outburst timescale, the team will be eagerly monitoring M31N 2008-12a with the LT and with other facilities over the next 12 months to see what happens next with this remarkable object.